US, 1948, 64 minutes, Black and white. William Gargan, Marjorie Lord, Ralph Byrd, Barbara Billingsley. This is a small thriller, the touch of the film noir with a femme fatale. It is based on a radio play by the director, Cy Endfield, an American who left the United States at the time of suspicions of people belonging to the Communist Party. He made a number of films in the United Kingdom, forming a company with Stanley Baker – and his main cinema claim to fame was Zulu. 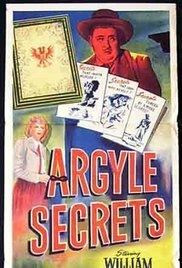 This film focuses on a newspaper reporter who has the opportunity to interview a dying man about a document, The Argyle Secrets, which turns out to be a list of names of people who were involved in collaboration with the enemy in World War II. The plot becomes more complicated when the man with the information about the file is found with a scalpel in him in his hospital room and the newspaper photographer dead behind the curtain. Many people are after the document and presume that the journalist has it and various people try to buy him off, beat him up, he is question by the police on suspicion of the deaths in the hospital. The main antagonists are a mixed group, each blackmailing the other for possession of the document and its potential for further blackmail. There is also a woman, Marla, Marjorie Lord, who is in league with the antagonists but uses her charms after the violence – she even seems to be convincing right at the end when she does pull a gun on the journalist who outwits her, calling an airport assistant to take the document to a waiting policeman. Also involved are bookseller who has come into possession of the document but is also beaten and killed. There is a rather suave large man, Panama, with the great Southern drawl, who is deadly on the one hand with the gun but also is absolutely afraid of being hurt. Neither the bookseller nor Panama survive. In retrospect, the film is not particularly interesting but is useful in looking at the career of the writer-director.